A mountain biker explores trails at the Summit Bechtel Scout Reserve high above the New River near the New River Gorge. 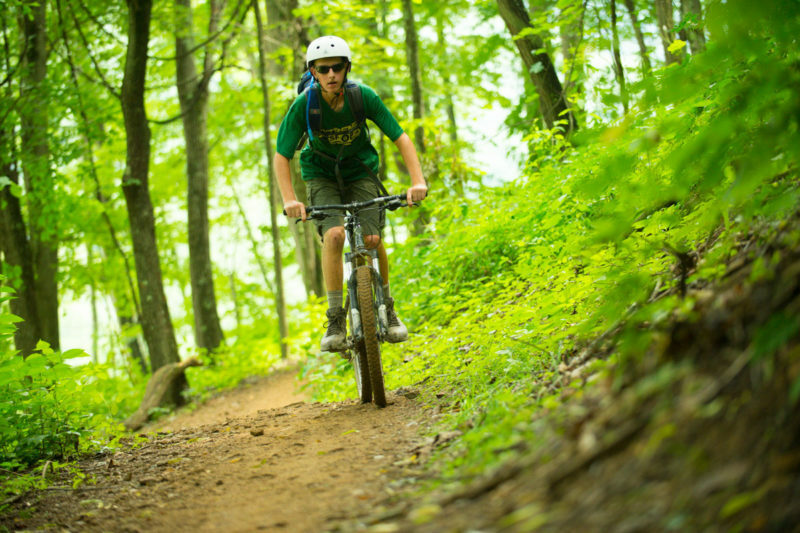 A 35-mile system of world-class mountain bike trails are now open to bikers off-season at the Summit Bechtel Reserve near Beckley, West Virginia, thanks to a partnership between the scouts and the New River Gorge Trail Alliance. The agreement allows bikers to ride the reserve’s cross-country and downhill-oriented mountain bike trails, which have been built for progression from basic beginner to expert, according the alliance president Bill Wells. Normally the trails are only available to scouts visiting the Summit, Wells said, but in the off-season, the reserve needs help maintaining their trails and is making them available to the public through the partnership. The reserve may best be known as the site of the national scout Jamboree, held there every four years, and one of the scouting organization’s five high-adventure bases. Officials at both the reserve and the trail alliance agreed the partnership is a win-win for scouts and local riders. Phil Waidner, an alliance board member, stressed the value of having riders on the trails in the off-season when scouts are not visiting the facility. “To stay in good shape, bike trails need to be ridden year-round,” Waidner said. David Kopsa, director of the High-Adventure Base at the Summit said he was looking forward to the increased community engagement. In order to ride the trails, members of the public must join the New River Gorge Trail Alliance and sign a waiver. Membership is $15 for individuals or $25 for families. The Summit trails are generally open to ride from late October through late April, but riders are advised to consult the reserve partnership calendar at the alliance’s website before heading out. The New River Gorge Trail Alliance is a non-profit organization that promotes the health and well-being of the area by building and maintaining a regional trail system.